Originally, bouillabaise would be made by fishermen in Marseilles and the French Mediterranean coast to use up any unsold fish and trimmings. These days, it tends to be a little more fancy. For the best flavour, make your own fish stock. You can, of course, use fish stock made from a cube, in which case you can skip this step. But nothing beats the depth of flavour you'll get from your own stock. Start by dicing the onion, leek and fennel. Heat the oil to medium-low, add the diced veggies and crushed garlic, fennel seeds, saffron, orange zest, cayenne pepper and thyme. Stir everything to get it well coated in oil, and cook it gently for about 10 minutes - you want to soften the veggies but not colour them. Add the wine to deglaze the pan and let it bubble for about 3 minutes to cook off the alcohol. Now add the fish bits/shells/bones and the can of tomatoes, tomato puree and parsley. Pour in enough water to cover everything by a couple of centimetres. Bring to the boil, remove any scum that appears, cover the pan and simmer for 45 minutes. Working in batches, whizz the pan contents in a blender until smooth, then place a colander over a large bowl, line it with cheesecloth, and strain the mush through it. You'll probably need to gather the cloth into a ball, spin it, squeeze it and massage it until you've extracted as much liquid as possible. Pressing it with the back of a spoon through a fine sieve can also work. At the end of the process, strain the liquid through a fresh cloth. Taste for seasoning, add salt if necessary. This sauce should be emulsified like mayonnaise, but thicker because of the breadcrumbs. Begin by mixing everything except the oil into a thick paste. Then use a stick blender to incorporate the oil, starting with a very slow drizzle. Once the emulsification has begun, you can add oil a bit faster. How you prep the fish depends on what you've got, but you'll want to get rid of any skin and bones, and end up with bite-sized chunks of fish. If you are using mussels, put them in a large bowl of cold water. Discard any that don't close or have damaged shells. Pull or cut the beards off the remaining mussels. With the broth in a large stock-pot, add the fish and shellfish, bring to the boil, cover and simmer for 10 minutes. Check that everything is cooked - the fish should be opaque, and shellfish shells wide open. Serve with lightly-toasted French bread smeared with rouille. The video above is from the Keef Cooks YouTube channel. 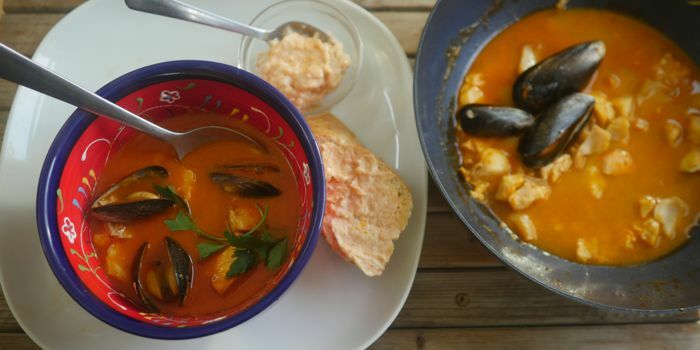 Click here to see the video recipe of Bouillabaisse with Rouille on YouTube.